If you notice your cat urinating more frequently or urinating outside the litter box, he may have a feline urinary tract infection (UTI). These common infections have specific symptoms and being aware of the signs can help you get your kitty the medical attention he needs. The symptoms for almost every condition that affects the feline urinary tract are similar. This can make it impossible to find out what is wrong with your cat without specific testing. Most cats that are suffering from a urinary tract infection will not have symptoms of generalized illness (fever, loss of appetite, lethargy, vomiting) because the infection is limited to a small part of the body. What Else Could Cause Urinary Tract Infection Symptoms in Cats? For any suspected illness, your veterinarian will initially perform a physical exam. This can determine if your cat has a urinary tract obstruction, dehydration, fever, pain, or swollen kidneys. If your vet suspects a urinary tract infection, she will likely recommend a urinalysis or a urine culture. The urine sample for these tests can be obtained in one of several ways. Many cats with a urinary tract infection will urinate frequently, and may even empty their bladders while on the exam table, in their pet carrier, or on the floor. Your vet can collect this urine, but it is not necessarily the cleanest sample. A few cats will urinate when your vet feels the bladder. 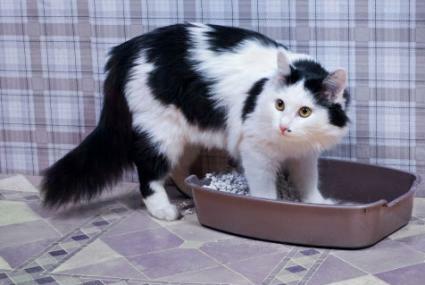 If your cat does this, it may be possible to catch the urine in a sterile container. For most cats, the vet will recommend a procedure called a cystocentesis in which a needle is inserted through the skin and into the bladder. A urinalysis will measure several parameters in the urine. While the results do not completely confirm a urinary tract infection, findings such as an increased number of white blood cells in the urine or bacteria seen in the urine will support the diagnosis. According to the Mercola pet website, a urine culture is a more definitive test for a urinary tract infection. The sample is typically sent to a laboratory where it is placed into a plate of culture media. The plate is incubated and checked for bacterial growth. Once bacterial colonies grow, they are identified and then tested to see which antibiotics they are susceptible to. This process usually takes several days, so your veterinarian may start treatment before the results are back. Your veterinarian may also recommend testing to rule out other conditions, particularly if your cat has other medical problems or a history of frequent or recurrent urinary tract infections. For some cats that have been urinating frequently, it will be impossible to obtain a urine sample for testing. Although this is not ideal, your veterinarian may start treatment for a presumptive urinary tract infection. You may still need to have your cat's urine tested at a later time. As outlined by Dr. Jennifer L. Garcia in an article for Veterinary Medicine, for an uncomplicated urinary tract infection, your veterinarian will probably prescribe an antibiotic for at least seven days. Even though your cat may seem to be back to normal in a few days, make sure that you finish all the medication. If your cat is in pain, you may also need to administer a medication to help her feel better. Your veterinarian may talk to you about several options, including buprenorphine (Buprenex or Simbadol), robenacoxib (Onsior), gabapentin (Neurontin), or a corticosteroid medication. Don't give your cat any human pain killers - these can be very toxic or even deadly to cats. For cats with idiopathic feline cystitis, numerous other treatments could be offered, including increasing water consumption, environmental enrichment, anti-spasmodic drugs, or a prescription diet. If your cat only has a urinary tract infection, these options may not be necessary. With a little attention to your cat's behavior, you can identify the symptoms of a urinary tract infection in your cat. Treatment is usually successful and your cat will be feeling like her normal self in no time.